Energy is the chessboard that connects all the players. What happens when the board changes shape in the middle of the game? If you don’t know the new energy landscape, you’ll have a hard time playing to a draw, much less winning. Today I’ll tell you about some big shifts in the energy industry. These shifts are about as positive as can be, unless you need high oil prices to run your country. In the long run, these changes are bullish for the whole world, which I think this will surprise many of you. And though we’ve been used to thinking about energy and technology as two different facets of modern life, today they are inextricably linked. When energy changes, everything else changes, too. Thoughts from the Frontline is now entering its 16th year of continuous weekly publication. I constantly meet readers who have been with me since the beginning – and even some who read an earlier print version of my letters. I put TFTF on the Internet in August 2000 as a free letter, starting with just a few thousand names, and was amazed at how rapidly it grew. It took just a few years for me to realize that this new thing called the Internet was the real deal, and I discontinued my print version. We now push the letter out to almost one million readers each week, and the letter is posted on dozens of websites. I began to archive the letter in January 2001; and every issue – the good, the bad, and the sometimes very ugly – is still there in the archives, just as I wrote it. I will admit there are a few paragraphs, and maybe even a whole letter or two, that I would like to go back and expunge from the record. But I think it’s better just to let it all be what it is. I thank you for allowing me to come into your homes and offices each week. I consider it a privilege and honor to be able to offer you my research and thoughts. This letter has been free from the beginning, and my full intent is that it will always remain that way. Longtime readers know the topics can vary widely over the course of the year. I write about what I find interesting that week. I find that writing helps me focus my own thinking. If you are reading this for the first time, you can go to www.mauldineconomics.com, subscribe by giving us your email address, and join my one million closest friends who get my letter each week. And if you’re a regular reader, why not give me a 16th birthday present and suggest to your friends that they subscribe too! I also want to thank the staff and my partners, who make it possible for me to spend the bulk of my time thinking and writing. And traveling, of course. And now let’s think about energy. Contrarian and value investors like to buy assets that are in distress, or at least “out of favor.” You don’t hear much about those assets at the time. That’s part of being distressed – everyone ignores you. So, following that logic, the last thing you want to buy is a stock or industry that appears on the cover page of popular financial publications. 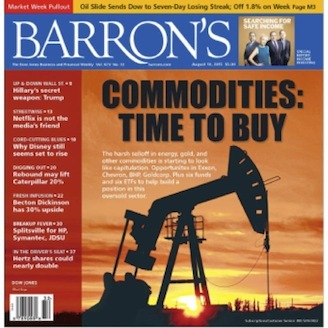 Commodity and energy bulls should take note of last weekend’s Barron’s cover. The harsh selloff in energy, gold, and other commodities is starting to look like capitulation. Opportunities in Exxon, Chevron, BHP, Goldcorp. Plus six funds and six ETFs to help build a position in this oversold sector. I presume the photo is supposed to show the sun rising on an oil rig, not setting. The article quotes some very smart people who are bullish on commodities right now. Some energy stocks look like real bargains. Barron’s is simply repeating the market’s conventional wisdom: After a brutal decline, oil prices are stabilizing and should head higher as the global economy recovers. That’s a perfectly defensible position – but I think it’s wrong. It’s wrong because it misses a major shift in the way we produce energy. Many people think OPEC’s high oil and gas prices led to the US shale energy boom. That’s not right. The shale boom was born in a time of lower energy prices, and it was the result of new technologies that make recovering large quantities of oil and gas less expensive than ever. I have written for years that Peak Oil is nonsense. Longtime readers know that I’m a believer in ever-accelerating technological transformation, but I have to admit I did not see the exponential transformation of the drilling business as it is currently unfolding. The changes are truly breathtaking and have gone largely unnoticed. By now, you probably know about fracking, the technology where drillers pump liquids into a well to “fracture” the ground and release oil and gas deposits. It’s controversial in certain quarters, especially among those who hate anything carbon-related. Fracking technology is moving forward like all other technologies: very fast. Newer techniques promise to reduce the side effects, at even lower operating costs. Furthermore, fracking is only the beginning of this revolution. The Manhattan Institute recently published an excellent (bordering on brilliant) report by Mark P. Mills, Shale 2.0: Technology and the Coming Big-Data Revolution in America’s Shale Oil Fields. I highly recommend it. The price and availability of oil (and natural gas) are determined by three interlocking variables: politics, money, and technology. Hydrocarbons have existed in enormous quantities for millennia across the planet. Governments control land access and business freedoms. Access to capital and the nature of fiscal policy are also critical determinants of commerce, especially for capital-intensive industries. But were it not for technology, oil and natural gas would not flow, and the associated growth that these resources fuel would not materialize. While the conventional and so-called unconventional (i.e., shale) oil industries display clear similarities in basic mechanics and operations – drills, pipes, and pumps – most of the conventional equipment, methods, and materials were not designed or optimized for the new techniques and challenges needed in shale production. By innovatively applying old and new technologies, shale operators propelled a stunningly fast gain in the productivity of shale rigs (Figure 4), with costs per rig stable or declining. Shale companies now produce more oil with two rigs than they did just a few years ago with three rigs, sometimes even spending less overall. At $55 per barrel, at least one of the big players in the Texas Eagle Ford shale reports a 70 percent financial rate of return. If world prices rise slightly, to $65 per barrel, some of the more efficient shale oil operators today would enjoy a higher rate of return than when oil stood at $95 per barrel in 2012. Read that last paragraph again. Some shale operators can make good money at $55 a barrel. At $65, they can make higher returns than they did three years ago with oil at $95. I have friends here in Dallas who are raising money for wells that can do better than break even at $40 per barrel, although they think $60 is where the new normal will settle out. Texans are nothing if not optimistic. How are these new economies possible? Answer: they bent the cost curve downward. It has fallen fast and – more importantly – it will keep falling. The same process that doubles the power of your smartphone every couple of years without raising its price, is also unfolding in the energy business. 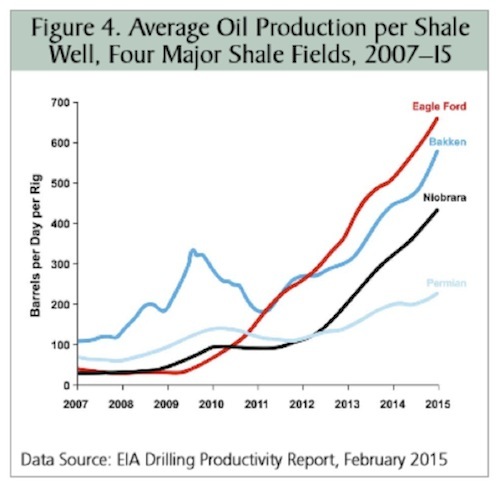 That’s why you see per-well production rising so fast in the Eagle Ford, Bakken, and Permian Basin fields. It’s not a result of more wells; rig counts have been falling this year. Rather, the producers are pulling more oil and gas out of the existing wells. IHS said an astonishing thing is happening as frackers keep discovering cleverer ways to extract oil, and switch tactically to better wells. Costs may plummet by 45pc this year, and by 60pc to 70pc before the end of 2016. “Break-even prices are going down across the board,” said the group’s Raoul LeBlanc. Shale bosses have been lining up at this year’s “Energy Davos” to proclaim the fracking Gospel. “We have just drilled an 18,000 ft well in 16 days in the Permian Basis. Last year it took 30 days,” said Scott Sheffield, head of Pioneer Natural Resources. “We’ve cut spud-to-spud time to 19 days,” said Hess Corporation’s John Hess, referring to the turnaround time between drilling. This is half the level in 2012. “We’ve driven down drilling costs by 50pc, and we can see another 30pc ahead,” he said. In my Dec. 10, 2012, Thoughts from the Frontline, I reported on my trip to see the Bakken shale fields in North Dakota. My host, Loren Kopseng, showed me some small pipe sections he called “jewels” because they were stainless steel in contrast to the dull brown of the pipe. They are to oil wells what microchips are to a computer. They are highly complex technology. The first wells drilled in the Bakken by Marathon Oil used one “jewel.” Five years later, Loren was using 23 in his wells, an exponential leap in production efficiency. At the time, he was envisioning using 30 or 40 per well by the following year, resulting in a phenomenal increase in the amount of production per well. A company here in Dallas called EKU Power Drives is developing eco-friendly alternatives to the big diesel-driven pump units that power most fracking wells. Their units can actually run on the natural gas the well produces – effectively letting the well generate its own power. This innovation greatly reduces the need for carbon-belching tractors, not to mention the need for tanker trucks to constantly deliver fuel to remote wells. Another friend is promoting a new technology that exponentially reduces the number of moving parts in a pump. Essentially, the moving part of the pump is a new material that expands and contracts because of an electric charge. While this technological advance will have wide application in a number of industries, one of the big expenses of oil wells is the continual replacement of valves and pumps. If you can make a pump cheaper and longer-lasting, you bring down the cost of recovering oil. That’s not all. “Walking rigs” can move around a pad, drilling multiple wells (in some cases dozens) in a small area. That ready mobility means less time and expense relocating equipment. Intelligent drill bits in those wells can maneuver themselves around obstacles underground, raising each shaft’s success rate. The biggest breakthroughs are just now beginning. “Big-data analytics” will make production even more efficient and reduce costs further. Companies gather massive amounts of data in the active shale fields. Computers can analyze that data and pick out optimal spots to drill more wells. Some of that data, incidentally, belongs to overleveraged explorers and drillers who are right now on the road to bankruptcy. Their data, like the bankrupt companies’ other assets, will eventually be sold to pay off creditors. Companies are already lining up to bid. Right now, some US shale operators can break even at $10/barrel. Costs for the “expensive” ones run around $55 per barrel but are falling fast. With massive quantities of oil and gas still in the ground, there is no economic reason these companies can’t make big money even if energy prices stay in the $40s. The Peak Oil proponents weren’t just wrong; they were exponentially wrong. We’re not going to run out of oil, and it is not getting too expensive to produce. Quite the opposite on both counts. Last year, while Americans celebrated Thanksgiving, the OPEC oil cartel, led by Saudi Arabia, decided not to reduce oil production. Their apparent goal was to drive prices lower and keep them low long enough to decapitate those annoying American shale producers. For a while, it looked like the gamble was working. Energy stocks plummeted as crude oil sank into the $40s. Producers slashed their capital expenditures, forcing layoffs at some top energy-service firms. The number of oil rigs in production plunged. The Saudis took a huge gamble last November when they stopped supporting prices and opted instead to flood the market and drive out rivals, boosting their own output to 10.6m barrels a day (b/d) into the teeth of the downturn. Bank of America says OPEC is now “effectively dissolved”. The cartel might as well shut down its offices in Vienna to save money. If the aim was to choke the US shale industry, the Saudis have misjudged badly, just as they misjudged the growing shale threat at every stage for eight years. “It is becoming apparent that non-OPEC producers are not as responsive to low oil prices as had been thought, at least in the short-run,” said the Saudi central bank in its latest stability report. “The main impact has been to cut back on developmental drilling of new oil wells, rather than slowing the flow of oil from existing wells. This requires more patience,” it said. One Saudi expert was blunter. “The policy hasn’t worked and it will never work,” he said. The technologies described above are reducing US production costs faster than the Saudi plan is reducing oil prices. OPEC’s pumping is mainly hurting its own members. That’s why Ambrose says the cartel might as well shut down. Saudi Arabia is trapped. If prices go up, US shale producers will uncap some wells and produce more. And if it isn’t the US, it will be Australia, Canada, or even China’s growing shale industry. Argentina has potentially massive shale oil plays. Ditto Mexico. There is oil and natural gas all over Eastern Europe. Oil-producing nations (and not just OPEC members) are losing the ability to subsidize their government spending with oil revenues. 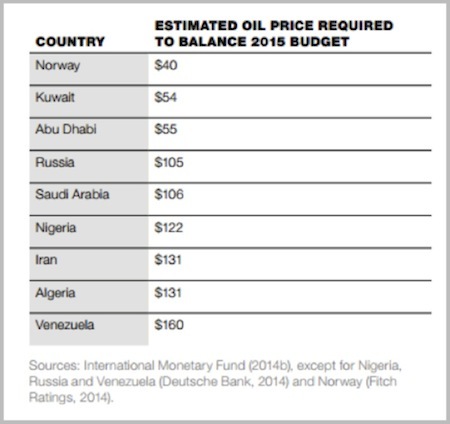 Look at this table of the oil price they need in order to balance their budgets. The Saudis have a big cushion, but it won’t last forever. That may be why this week the Saudi finance ministry sold government bonds for the first time since 2007. That said, the debt-to-GDP ratio in Saudi is essentially negligible; and when I sent Ambrose’s rather negative Saudi outlook to some of my friends in Saudi, they were all quick to respond about the potential for the Saudi government to make cuts and deal with lower-priced oil, just as they have in the past. Venezuela? They are essentially screwed. OPEC countries have no one to blame but themselves. Those years when they kept prices at $90 and higher gave the fracking industry, as well as solar and other alternatives, time to develop. They can’t put that genie back in the bottle. For the time being, the US is now the “swing producer” for both oil and gas. Production costs in the Bakken and Eagle Ford will be the top of the range going forward – and that cost is a lot lower than most OPEC members currently need to sustain their governments. Over time this is going to mean a significant readjustment in the spending of most Middle Eastern governments. I expect that the increase in the production of oil will actually slacken somewhat over the next year, as rig count is down, a pattern we have seen in the past. But production is not going to fall as much as oil pessimists think. Further, US production is likely to rise over time, even at $50–$60 oil. Does cheap shale mean solar, wind, and other alternative energy sources will lose momentum? I don’t think so. Governments around the world still want to reduce carbon emissions. For that matter, so do I. I prefer not to see the air I am breathing, thank you very much. The newer shale oil production techniques are better on the environmental front, but they still produce significant emissions. And while costs are dropping for drilling oil and natural gas, the cost of solar energy is dropping even faster. In fact, the real revolution is in the dramatic fall in the cost of producing a kilowatt of power using solar energy. What I think will happen is that shale, and particularly shale gas, will be the world’s “bridge” to cleaner energy sources. Solar is already more cost-effective than fossil fuels in some tropical countries. It will keep growing in those places, even if the developed world loses interest. 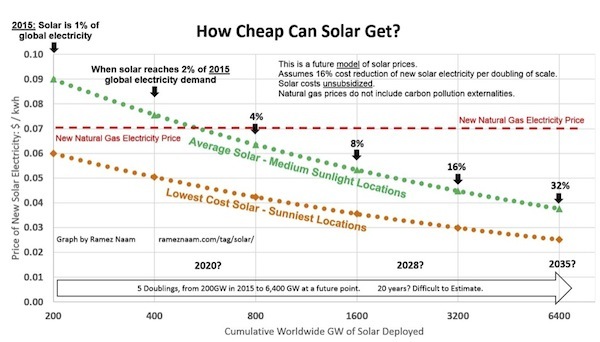 To get an idea of how the cost of solar energy has fallen in the last few decades, check out this article by Ramez Naam. 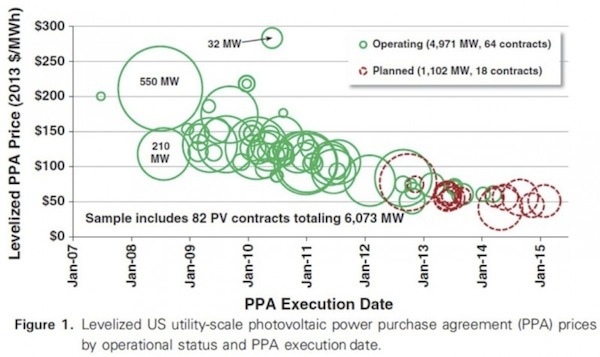 His first chart shows the prices agreed to for solar power purchase agreements in the last eight years. The cost of solar power is clearly coming down and is now almost half what it was less than 10 years ago. Every doubling of solar power production reduces the cost of new power purchase agreements by about 16% because of lower module costs, lower “soft” costs, lower overhead management costs, and higher capacity factors. Moore’s Law is alive and well in the solar industry. Where is the cost of solar going? It will not be long before solar is competitive with natural gas. Yes, coal will still be cheaper for another decade or so, but at the current pace of progress – and there seems to be no technological reason that progress won’t continue – solar will be cheaper than even coal. And it is certainly much cleaner. We also have to distinguish between electricity and transport fuels. With apologies to Elon Musk and Tesla, the electric cars aren’t quite ready for prime time yet in terms of cost, although the quality of a Tesla is amazing. Meanwhile, fuel cell technology is progressing rapidly. We may see fuel-cell cars move ahead of rechargeable electric ones in the coming years. I don’t have any preference between the two – nor should you. Let them compete, and we’ll see what works best. Consumers will win either way. In fact, this revolution will have many winners. Shale oil and gas producers who have aggressively implemented the new technologies and staked out prime deposits should perform very well, even at today’s low prices. The US chemical industry, which uses huge quantities of fuel, is already starting to build new facilities near the shale production zones. This will give them a leg up on foreign competitors whose fuel supply is more expensive. Energy-importing nations like China, Japan, and parts of Europe will be able to buy fuel at bargain prices from reliable US producers. Note that just today the Obama administration agreed to allow US oil to be sold to Mexico. Even if Congress doesn’t go along this year, there is a developing consensus that we should be selling oil and natural gas from the US. That will increase our drilling here and create jobs while helping to reduce our trade deficit. There is no reason to bottle up resources when we have plenty to share with the world. I hope energy exports will happen soon, but I see a bright future even if they don’t. Energy costs have long acted as a “tax” on economic development. Now we are on the way to a world where energy is either very inexpensive or downright free. Think of solar energy as digital energy. Just as the cost of data storage has come down, the cost of energy is going to come down as well. This trend will spur economic growth in ways we can only imagine now. Of course, these developments have large geopolitical ramifications, but that’s a topic for another letter. The subject does, however, bring up an interesting thought about how we measure GDP. In another 10 years we are going to see a wave of home solar installations, especially in the southern tier of the United States as the cost of installation falls and battery technology improves. Let’s look at that from the standpoint of measuring GDP. For simplicity sake, let’s say you buy $10,000 worth of electricity a year from your local utility. That is $10,000 of GDP. Now let’s say you spend $40,000 to put in a solar system that allows you to get off the grid. That is a one-time boost to GDP of $40,000. But now you no longer pay $10,000 a year to the utility, so as long as you are on the solar system, you are no longer contributing to GDP. Further, if you buy an electric car and charge it, you are no longer buying gas, and thus the portion of your money previously spent on fuel is no longer contributing to GDP. Yes, your money is available to be spent elsewhere, but you could also save it or invest it. You will be using the same amount of electricity, so your lifestyle will be the same, but it will not be measured in GDP. There is a growing debate among economists, especially those around Silicon Valley, as to how we should be measuring GDP. I finish this letter back in Dallas, where I will be for a few days before I go to New York in the middle of next week for business (even in August) and then head up to the Hampshires to spend the weekend with my friend Jack Rivkin of Altegris. We may visit Doug Kass, who is in the area; and with Jack who knows what else we may run into? He seems to know everybody. Then on Monday we’ll take the ferry over to Connecticut and drive up to Gloucester to stay with my friend Dr. Woody Brock at one of the most interesting summer homes in Massachusetts. The Guggenheim actually did an entire book on his art collection and furniture (a lot of serious Napoleon-era furniture). It is quite the museum tour, but the part that I really love are the grounds around his home, which are home to an amazing assortment of obelisks, pyramids, temple replicas, and massive sculpture, all in a park-like setting with a fabulous quarry lake. At night the lighting is amazing. In addition to admiring the art and relaxing, Woody and I will spend a great deal of time talking through all things economic, with an emphasis on where the world is going over the next 20 years. After a few days we will drive back down to Boston, where we will stay with Steve Cucchiaro, who has a new catamaran and has promised me smooth waters to sail upon (I suffer motion sickness all too easily). Of course, when you have the founder of Windhaven (now retired), you have to talk portfolio design and investing. Then it’s back down to New York for a few days for some meetings, and maybe we’ll catch a play or two. I’ll be back in Dallas by the middle of the week, and my September looks surprisingly void of travel. This is good, as I need the time to work on my book. Deadlines wait for no man. I spent the last few days in the mountains in Whistler, British Columbia, with my good friend Louis Gave. Louis has a vacation home at the top of one of the mountains (quite the different venue from Hong Kong). He was rounding out his summer, so he required us to go along with a few of his friends to do this thing called the Sasquatch. It turned out to be a 1.4-mile-long zip line stretched hundreds of feet over and across the Whistler Valley. The initial drop is several hundred feet, and you quickly accelerate to more than 80 miles an hour. I truly had no idea what I was in for as I stood at the edge of the platform and looked over, and quite frankly I almost panicked. It seemed like we were at the tippy top of the world. It’s one thing to know in your mind that it’s perfectly safe and another thing to step off the edge of a perfectly good platform. I took comfort in the fact that one of Louis’s friends – a longtime member of the French Foreign Legion and a serious risk taker on mountain bikes and skydiving – also expressed a little nervousness. But it was small comfort. Only the potential embarrassment of having to walk back down the mountain by myself made me actually go through with it. It was not as terrible an experience as a vicious bear market, but only because it was over quicker. I would prefer not to experience either again. I must say, however, that Louis, who is a bit of an adrenaline junkie, seemed to end the adventure with his heart pumping almost as fast as mine. Have yourself a great week. I intend to do nothing more adventurous this weekend than watch a movie and read a science fiction novel. I’ve decided that I prefer to have my adrenaline rushes vicariously. Aug. 17, 2015, 1:20 p.m.
Net metering is a ripoff of other ratepayers. You’re effectively getting a battery with infinite storage capacity for free. Someone, however, is paying for this and it’s mainly the other utility customers. Not only is this highly regressive, i.e. only the well off can afford to install a solar system and take advantage of the subsidies and tax credits, (much less afford to buy a Tesla) but it can only survive if the penetration of solar into the grid is small. The example given, buying a solar system that would supply $10,000/year of electricity for $40,000 free of the grid is off by at least an order of magnitude because it doesn’t include the batteries. $10,000 at $0.10/kWh is 100,000kWh or 100MWh. That’s a lot of energy. Assuming that your solar system works on average for 5 hours/day, you’d need a 55kW nameplate capacity solar array. That’s at least 5,500 square feet of shade free solar panels. That in itself would cost more than $40,000 with no government subsidy. And batteries would be a whole lot more. Even then, you’ll likely still need some other form of backup. How much battery storage would you need? $10,000/year at $0.10/kWh is 274kWh/day. For simplification, I’ll assume a constant load, so it’s 11.4kWh/h for the 19 hours that the solar panels aren’t working. That’s 217kWh of storage needed. The Tesla power wall is currently priced at $3,000 for 7kWh of daily cycle storage. You’d need 31 times that for just one day, $93,000. And when the sun doesn’t shine one day, then what? Either you fire up your fossil fuel generator or go back on the grid. Being connected to the grid should properly cost something even if you don’t use it every day. Energy you sell back to the grid should be at wholesale, not retail price. Aug. 16, 2015, 11:09 a.m. This is were the eco cabel has everyone confused - do you mean carbon or CO2? Carbon dioxide is NOT carbon. You cannot see carbon dioxide, our planet needs carbon dioxide to live. Now too much MIGHT imply some climate change - but this is a very different issue from carbon. Aug. 16, 2015, 2:12 a.m.
Congratulations on 16 years, keep up the great work. The article seems to miss one important point, coal only gets a brief mention. Coal currently produces 41% of the world’s electricity (not mentioning its use in direct heating, steel-making, etc.) This shows little sign of abating despite all the expenditure on solar, wind, and other alternatives, and it is not due solely to the rising energy needs of China and India. The International Energy Agency says global electricity from coal is expected to grow by about 33 per cent to 2040 with demand from S.E. Asia alone expected to rise by nearly 5% a year through 2035. Bloomberg’s New Energy Outlook says coal will continue to play a large part in world power, and that emissions will continue to rise for another fifteen years, unless further radical policy action is taken. It estimates greenhouse gas emissions will be 13 per cent above 2014 levels in 2040 as a result. The US journal Proceedings of the National Academy of Sciences describes “a global renaissance of coal driven by poor, fast-growing countries that increasingly rely on coal to satisfy growing energy demand” which is not restricted to major users like China and India. As is pointed out in other posts here, electric cars, buses, and other modes of public transport must be driven or charged via the power grid. I have to wonder how this third wheel (or is it fourth) in the “Energy Wave of the Future” affects the calculations on the others. Aug. 15, 2015, 7:10 p.m.
Bank of America says OPEC is now “effectively dissolved”. The cartel might as well shut down its offices in Vienna to save money. If that is correct it means the Saudies did not lower the oil price. Instead the Cartel fell apart and they were no simply longer able to maintain the high price. It’s preposterous to suggest that the Saudies purposely forced down oil prices by 50% in order to grab say 5% more market volume. The Cartel price collapsed due to too much non-OPEC production. Question now is whether governments will allow oil to be produced at low royalties. maybe we need a new international government oil cartel? At $40 per barrel about 25 cents per liter why not leave the oil in the ground for the future and just burn the OPEC oil? Aug. 15, 2015, 2:15 p.m.
Firstly, congratulations on 16 year of TFTFL. Next to “carbon” as you call it. IMO, you should be more specific whether you refer to carbon, the element e.g. graphite, diamond, soot, graphene, bucky ball fullerene, “that of which life is made”, or carbon dioxide, the transparent, odorless gas which, although much maligned, sustains almost all life on our planet. The first, a solid, is no longer much of a pollutant, al least in USA, witness clean air and buildings. The second, a gas, is a significant plant food fertilizer, of which we could use much more in the air. We currently have a situation where precious food is used to make alcohol for transport and the gaseous fertilizer for the same food is demonized by the politicos. Thus food prices are higher then otherwise as attempts are made to reduce their yield, not least by POTUS. Aug. 15, 2015, 4:47 a.m.
I’m really surprised that you are calling a pump-jack an oil “rig”! You, a Texan of all people, should know the difference, no? But you’re right about the rest. Peak Oil is a non-starter as the new technologies will make the North American oceans of oil available for a very long time. Have a great week,sir.